Osney was the site of an important Augustinian priory, a community of priests who followed the rule of monastic life (Austin canons regular). Founded in 1122, the priory became a highly regarded school for theologians and influenced the development of the university at Oxford. 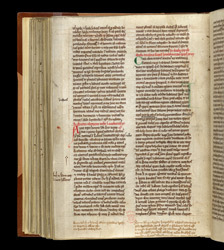 This manuscript, which originally belonged to Osney abbey, has a copy of the 'History of the Affairs of the English' ('Historia Rerum Anglicarum') by William of Newburgh (1136-1198). William wrote history in the tradition of Bede. He tried to connect events and evaluate the characters and actions that brought them about but avoided filling out a narrative with legends like his contemporary Geoffrey of Monmouth, of whom he was scathingly critical. His 'History' covers the reigns of English kings from William the Conqueror to Richard the Lionheart, 1066 to 1198. The 'History' is valuable to modern knowledge because of its coverage of the12th century. On this page, William tells of the death of Robert Bloet, bishop of Lincoln, and the accession of Alexander, in 1094. In the second column he begins to relate the complicated events of the reign of Amalric I, the western Christian king of Jerusalem (1163-74) installed as a result of the crusades. Amalric tried to seize Egypt, but the Turkish sultan Nur ad-Din frustrated his attempts.